Drawing in two registers. Upper register: Octagonal shaped ceiling panel with a large group of figures of Greco-Roman gods. Flying figure of Mercury between the two registers. Lower register: within a painted architectural enframement a scene with many figures representing Achilles revealing his true identity at Court of Lycomedes. Frieze beneath scene depicting armor. 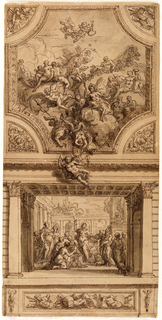 Signed in lower left hand corner of scene in pen and black ink: J Th. . Inscription in graphite beneath scene: "Palace of Lycomedes".